Do women need to choose between motherhood and a successful career? That’s the interesting topic Samantha Hamilton explored through her Master of Business research. 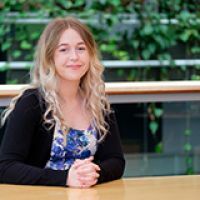 “The aim of my research was to obtain stories from established women academics about their experiences of first-time motherhood, and how becoming a mother has impacted their academic careers. Academic careers is a widely researched topic, especially in terms of gender issues, but motherhood hasn’t been as broadly discussed. It’s a topic that’s close to her heart, Samantha says. Since her early days at university, Samantha has not only successfully completed her Bachelor of Business but also simultaneously finished a Master of Business and a Bachelor of Laws. She would highly recommend postgraduate study to others, says Samantha who received the AUT Business, Economics and Law Postgraduate Academic Excellence Scholarship to support her studies. AUT’s strength is its future-focused education, Samantha says. The supportive environment is another highlight for her.